You get more than 2.2 million results by entering “Gantt chart“ in Google. The bar chart that is widely used in project management has been pronounced dead ever so often, but still seems to be highly relevant. The engineer and consultant Henry L. Gantt (1847 – 1919) lent his name to the diagram which was mainly used to optimize productions flows in the early years. Henry Gantt’s main focus was to utilize machines to their full capacity by using this chart. 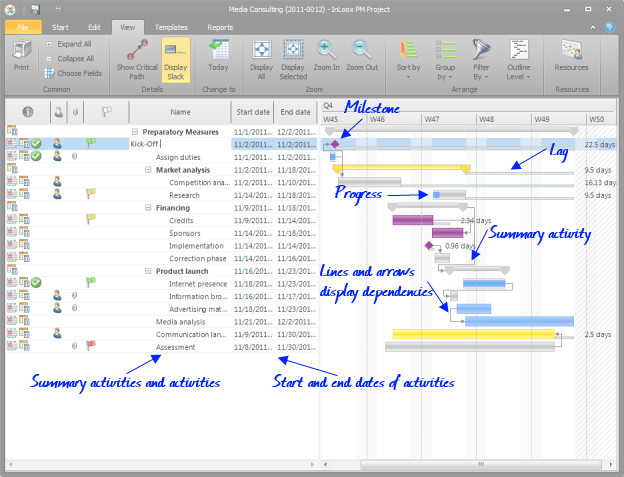 The Gantt chart shows project-related activities. The text part on the left side usually contains the activities in table columns as well as the related start dates, end dates and the durations. The visual part on the right side displays horizontal bars that visualize the duration, start and end date of each activity proportionally on a time axis: The longer the bar, the longer the planned duration of the activity. The precondition to create a Gantt chart is an elaborated project plan. Before starting to create a Gantt chart, the project team has to be well aware of all necessary activities and has to put them in the right logical and chronological order. This order determines the sequence of activities in the Gantt chart and in the project itself. The project director also has to assign a working time calendar that forms the basis of the Gantt chart. Working and non-working times determine the duration of the activities and of the project itself. It makes a big difference, of course, if the work week has 35 or 60 hours, if the team works 24/7 and if Saturday is a working day. The number of holidays and vacations in the project plan also influences the duration of the project. Besides that, there are time constraints that define the position of a bar in the Gantt chart. Some activities have to start or end on a certain day. “No earlier than” or “no later than” are also widely used. For example, if a customer presentation has to take place on a certain day, the preparations are supposed to be completed no later than on that very day. Too often, project teams only use activities with fixed dates in their Gantt charts and neglect the logical links between them. That makes it difficult to update the plan. It is much easier to use dependencies in the project plan, e.g. the classic end- to-start relationship. Example: As soon as the designer has finalized the print file, it has to be given to the print shop. If the designer is late, the delivery to the print shop is automatically delayed accordingly – but only if a logical dependency between the two elements has been set in the Gantt chart. A fixed date, however, has to be corrected manually. As soon as the project realization has started, completed activities and the progress can also be entered into the Gantt Chart. The Gantt Chart - Part 1 - InLoox • Copyright 1999-2019 © InLoox, Inc. All rights reserved.